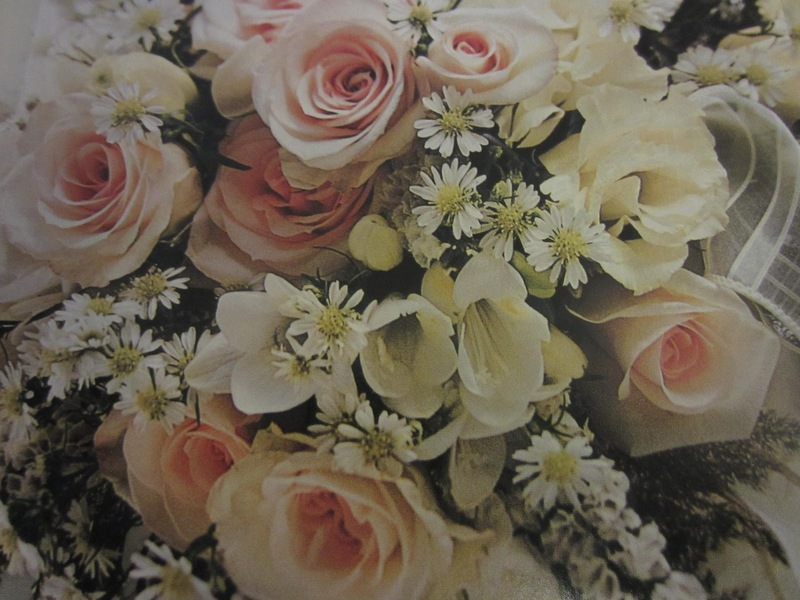 Rum Pinkspiration- my wedding bouquet inspiration ! 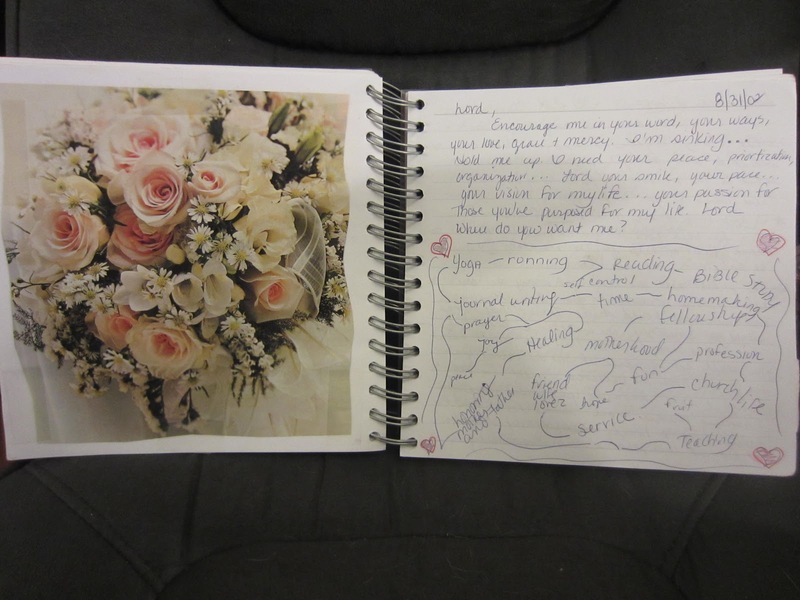 This journal entry comes from what could be called The Engagement Journal. preparations.The bouquet picture was used as the inspiration for my own wedding bouquet. This entry is dated 8/31/02. The pictures below are of the cover of the journal and the pages I am sharing. This is the first of my entries in our new Blog Hop (making good use of all our old journal writing!)! your pace…your vision for my life…your passion for those you’ve purposed for my life. Lord, where do you want me? That’s my wedding party in the top right picture! Wedding plans had my mind racing apparently. It was a short entry…and desperate. Please come join in the new Blog Hop – Link Up hosted by Recovering Church Lady and me! Yippee! Remember a while back when I mentioned that Susie from Recovering Church Lady and I wanted to host a link up for journal writing. 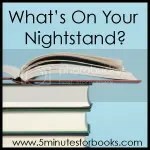 We both are journal keepers and bet a lot of our Bloggy friends are as well. Well we are taking flight and hoping you will join up in this joint venture and link up and share with us. Here are the rules: Susie and I hate rules. Rules seem so restrictive. So let’s just say these are our “guidelines” for linking up. 1. Dig out one of your old journals, or a recent journal or anything you have scratched out your random thoughts or feelings on as a form of expression (die-hard diary keepers will write on anything when desperate). Choose an entry, or a portion of an entry that you feel bold enough or at least comfortable to share. 2. Write up your blog post, publish and link up here. We don’t have a Meme thingy yet, but if you just link back to this in your post that will work. (Random Journal Day Weekend Link Up) If anyone wants to make us a meme thingy we will welcome you as a co-host with us! 3. Kindly visit and comment on the person before or after you in the link up. You can visit more but we understand that everyone is busy. Please visit at least one other Random Journal Day Link Up as that just would make it nice for all. Susie and I will be linking up asap. Feel free to link up anytime during the next week through Friday. We are planning on doing this every weekend, okie – dokie? 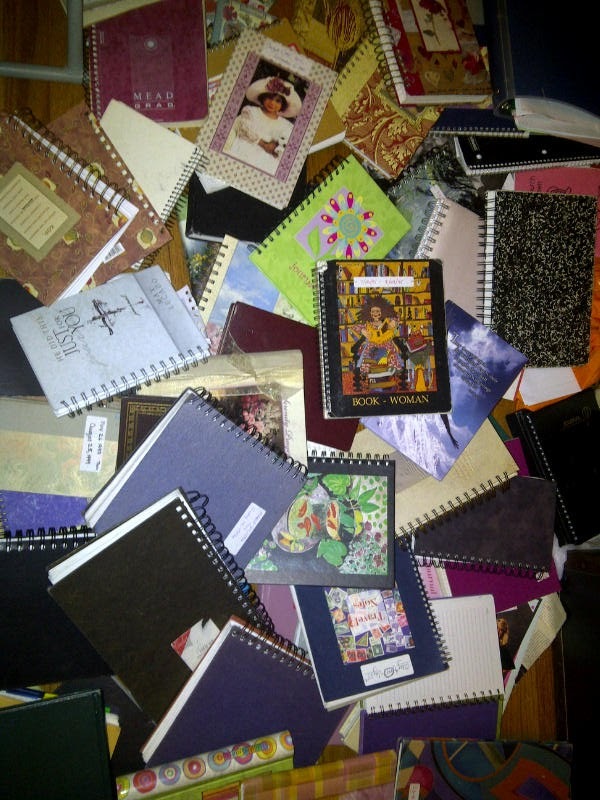 Now dig in your journals pile and share away! PS: This is our first attempt. Expect some glitches! But let us know if anything is really whacky! 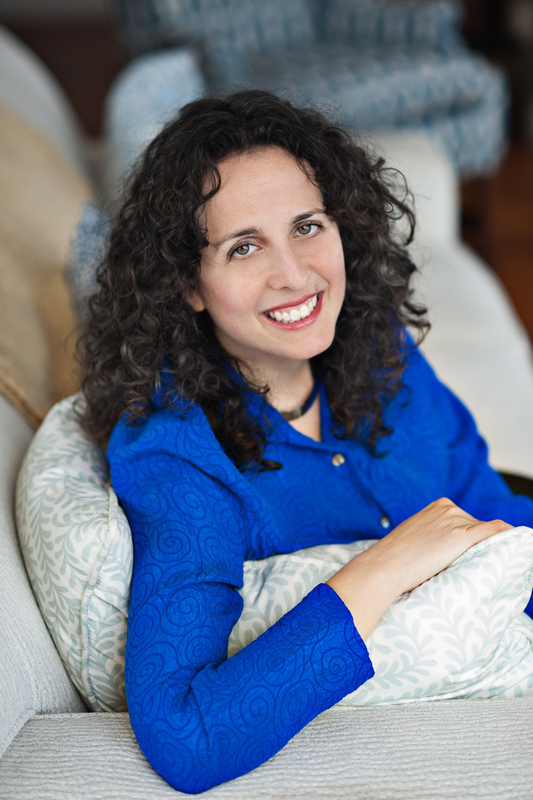 Our Inspiring Women for today is Dawn Stegall, owner of Faithfully Yours a Scrapbook Site dedicated to remembering God in scrapbooks. Dawn has recently released a wonderful kit to help Scrapbook fans express their faith goals in a focused and beautifully creative manner. Currently Dawn is finalizing the Faithfully Yours Design Team for 2012. The team shares their faith and work through a number of ways including: layout, theme based projects, devotions, writing and prayers in uniquely inspiring ways on the Blog and the Facebook Group Page. I actually have followed Dawn since 2008 when I myself searched for “Faithbooking” details online. 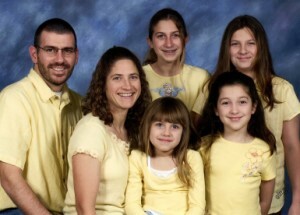 Dawn has been married to Shawn for 17 years and is also Homeschooling mom to her four beautiful daughters. It truly is an honor and blessing to have the opportunity to interview her here as part of this series! Dawn, thank you so much for taking the time for this interview, I am excited to share you and your wonderful creativity with my friends here at Beneath The Surface! Well, first of all, thank you for that wonderful introduction. I did homeschool my four girls for 5 years. I still homeschool the two youngest, but the older two are in their second year at a Christian high school. They are both involved in sports and love it! The two youngest are in dance. Faithfully Yours has grown from the early days- when did you first start off and how did you determine that it would be worthwhile to pursue this as a business? I started in the spring of 2005. It was actually at this time when God was calling me to homeschool. To be honest, I kicked and screamed and selfishly thought “what about my business?” At the time, I handmade Christian greeting cards, journals, etc. and most were made to order. 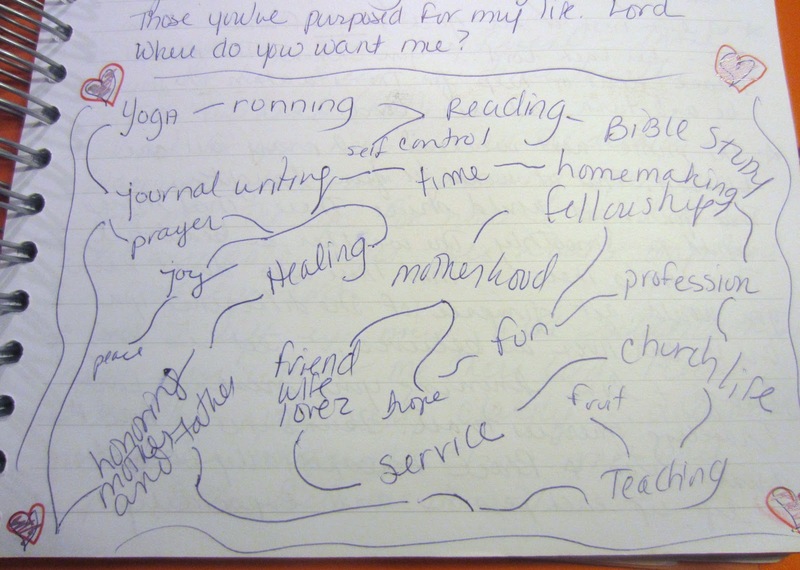 This was time-consuming and the thought of homeschooling 4 girls in 4 different grades when I was just about to get the youngest off to preschool….Well, needless to say God had an answer. I had a faithbooking category in my little shop where I sold handmade tags with scripture on it to be used as embellishments in scrapbooks. I received many new visitors because they were searching for faithbooking. I then realized I didn’t need to quit my business, but change my focus. StampinglyYours became FaithfullyYours. What kind of obstacles did you encounter with the development and planning of the business? Time and money! I’m an early bird, so I would spend early morning time and in the afternoons after school. In the beginning, I found product I could purchase in low quantities to resell and slowly added new inventory as I was able. I know that the Scrapbooking Industry has been somewhat impacted by the current economy, yet you have a unique product, how has this impacted you as you have been growing and shaping your business and decisions? Almost all Christian scrapbook companies have gone out of business or faith lines have been discontinued. 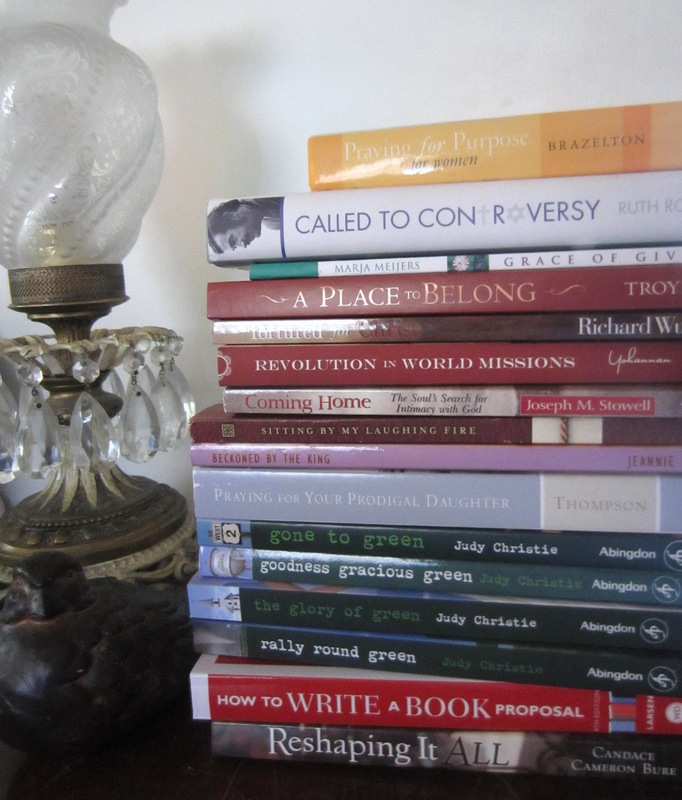 I still get new people finding me looking for ideas, inspiration as well as Christian supplies. Therefore, I decided to start designing and manufacturing my own line. So what exactly is Faith-booking compared to Scrap-booking in your opinion? * Use verses/scripture-You can find verses ready to go in the form of stickers, printouts, die cut sheets, scrapbook paper etc. Another great resource is to use a scripture concordance and look up a verse based on the topic of your page. * Journaling-Simply tell the details about the photo on your page while describing how God was there the whole time! * Photos-Take pictures of VBS, a church picnic, youth group activites, etc. In the future, your children can look back and remember their Christian upbringing and God’s faithfulness. * Title-The title tells what the whole page is about in one short instance. Make the most of it! 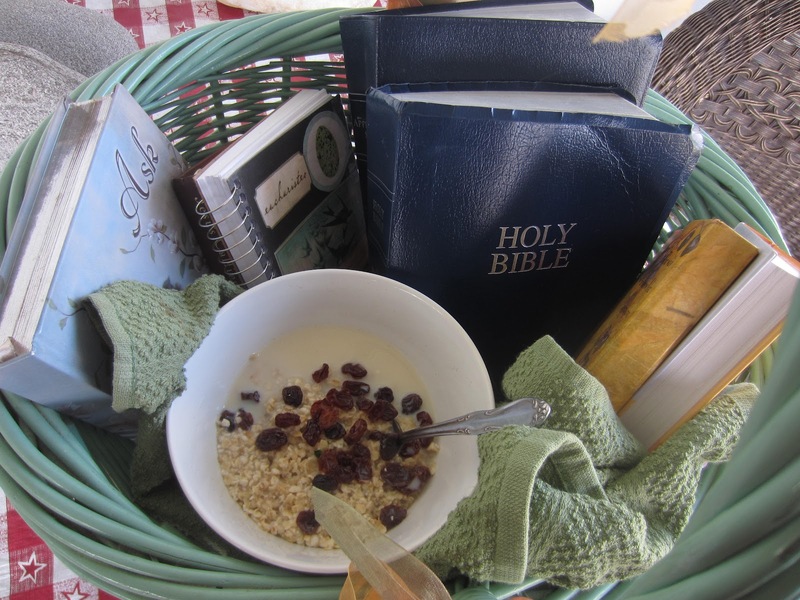 *Supplies-Sometimes by just using supplies with a Christian theme helps to remember your faith and how God is always present. What do you believe are the benefits of Faithbooking? We are forgetful! We aren’t much different the Israelites after they crossed the Red Sea on dry land. After experiencing that miracle, it was a mere 3 days later they began grumbling about being hungry, wishing they were back in Egypt where they had meat. We say we wouldn’t forget the miracle or that God couldn’t provide, but we do. God provides one day and a few days later we are complaining about lack. We need help remembering all about God! Do you use Scrapbooking in your homeschooling in any way? I have done the occasional scrapbook layout about homeschooling, but I haven’t used it in homeschooling. 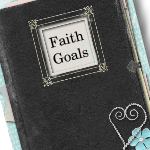 I love the new Faith Goals Kit– can you share a little about how you came up with that and what the features and benefits are? When the new year rolled around, I was getting caught up in the idea of making New Year’s resolutions. Every year I make them, and every year they are pretty much the same as the year before. I wanted this year to be different. I thought what needs to happen? God needs to be a part of my goals. So I designed a webinar and kit around that need. The kit is journal-rich allowing plenty of room to not only record your goals, but your progress, how God spoke to you and lessons learned. What would you say your mission or role is with regard to your creative community and team? The purpose of the design team is to offer ideas and inspiration for remembering God. I am only one person with my style. I can’t represent all design styles nor is my story the same as someone else’s. Although you can still be inspired by another person’s story. The facebook community is a place for fellowship, accountability, asking questions, prayers and praise reports. It is such a wonderful place to ask, receive and share! 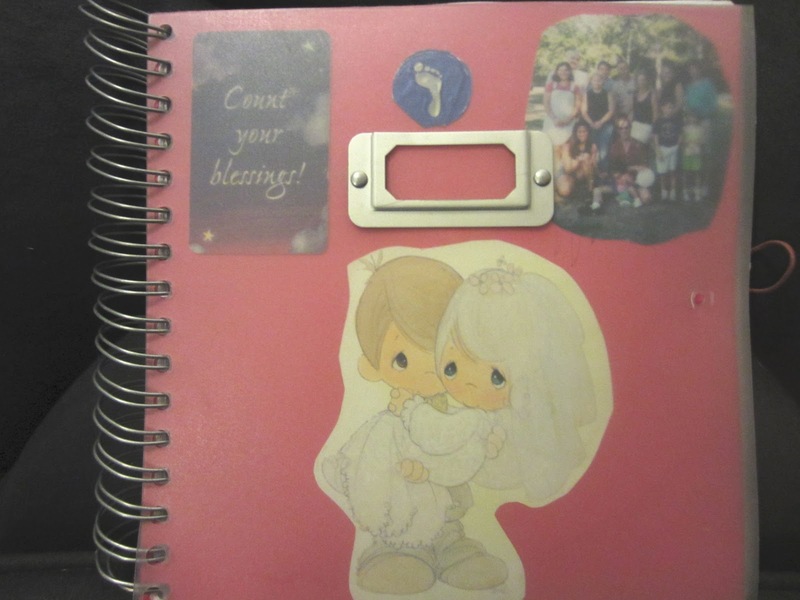 Do you think that scrapbooking can be seen as a form of worship? Yes! I’m at a loss of words how to explain. But I feel you can praise, thank, and creatively express your feelings through your scrapbook pages. Where do you and your family make your home? We live in Granite City, Illinois, 20 minutes from downtown St. Louis. (7 minutes from the Creating Keepsakes convention) I grew up in a suburb north of St. Louis and returned “home” with my husband after our time in the Air Force. My in-laws lived in Illinois and we started attending their church. We found ourselves at church several times a week and thought it best we move closer! I read on your Blog that you train for triathlons – can you share a bit about how you got started and if this is a family endeavor? Oh, I should update that. When we did triathlons one of my daughter did as well. She did her first one at age 9. While the whole family didn’t race in the triathlons, they were definitely all involved. Now we spend our time “running” kids from cross country to track to soccer to dance. tell us your best secrets for managing all the “balls” including the much coveted quiet time! My day starts at 5, hubby off to work by 6. Then I get my quiet time in. I guess that is the secret, having at least 30 minutes to begin my day with Him. 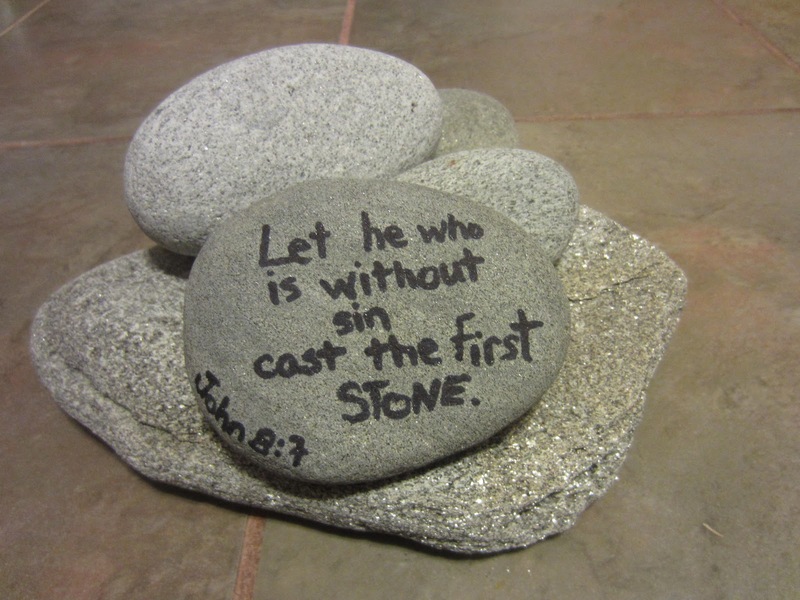 I often recall scripture pertinent to what I may be going through. I’m a huge multi-tasker, not sure that is a good thing though. Also my mother-in-law helps out with homeschooling. What is your absolute favorite way to relax? Relax? I love to read, but beyond quiet time in morning, it doesn’t happen often. One thing I love is spending time with just the 6 of us. We sit around the living room playing games, telling stories, playing guitar and singing worship songs and laughing. When we lost electricity awhile back, we did just that and it was such a blessing. Do all your girls also enjoy Scrapbooking and Faithbooking? Not as much as I would like. Right now they are pretty busy, but I have bought them albums for the 1,2,3 faithbooking method. Kimi likes to scrapbook her dance photos. Kori wants to scrapbook her pets, but hasn’t done so yet. Although she has done a few other pages. Do you have any last words of inspiration or encouragement for us? Faithbooking doesn’t have to be time consuming nor do you need a lot of supplies. Think of it as an extension to journaling. 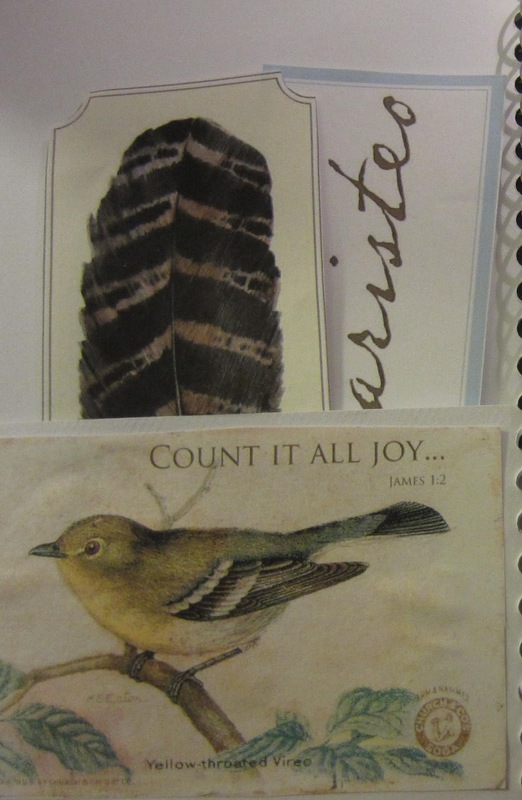 By writing down and recording God in your life and then expand a little by adding photos to help you remember, supporting scriptures or anything you like. As long as God is glorified, it is all good! Faithbooking is also a wonderful witness tool! As your friends and family look through your scrapbooks, reading and learning about your faith and who God is through your eyes, can sow seeds. Thanks again, Dawn for taking the time to stop by and share how you use your gifts & talents in this unique ministry for His glory! may God continue to use you all to inspire, sharpen and encourage others through your creative gifts! Product Giveaway Contest for thrifty crafters! Seriously my reading has slowed down lately, so here is my boring update…I might be slightly reading anemic. 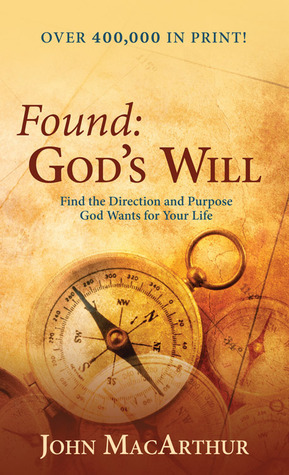 Praying For Purpose by Katie Brazelton- I am loving this one and read it daily OK almost daily. It is a daily format hence my excuse for not finishing! Are you convinced I am the slowest reader ever yet? Seriously I have been very busy. 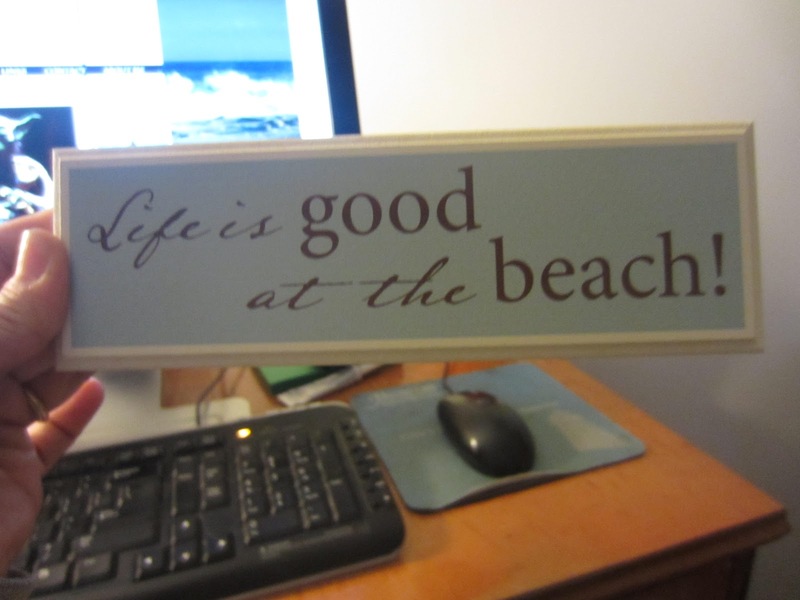 I think I need a nice vacation where I can just read for a weekend with a tall drink on a beach or poolside. Hmm. Can you picture me there? Or are you selfishly imagining yourself there… I forgive you. Do you see that stack? There is more, where that came from- I have too many books. Not to mention that last month I won a slew of books. Poor book-loving me. 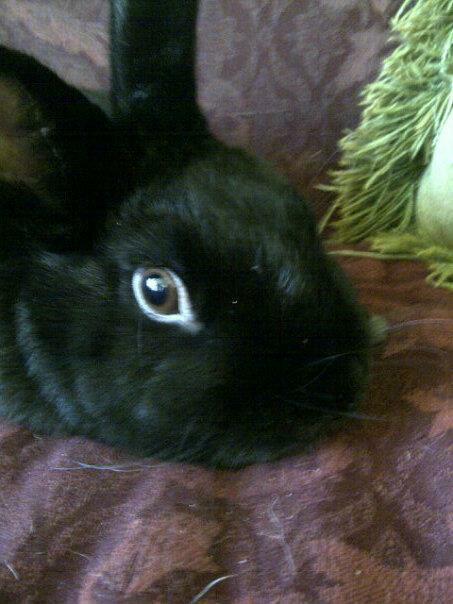 You are feeling sorry for me, right? I didn’t think so. I loved this book and suggest it for those of you who are looking to seed scripture into your heart and be encouraged through the practice of scriptural prayer. Jody has also written a book for parents of teens which I have not read yet, but I assure you I think it will be useful. Jody is a Moms In Prayer (formerly Moms In Touch) Leader and has much to share from her personal experience. A quick read and good to share. I got this one as a freebie. John MacArthur is a favorite teacher of mine. This is a small one, good to pass along in discipleship or friendship evangelism situations. 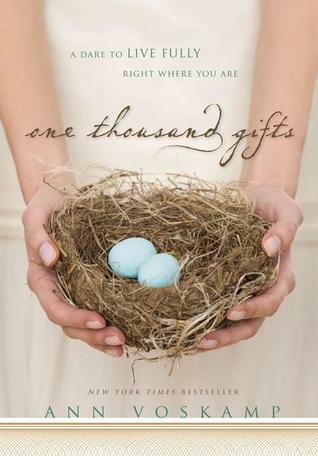 Last but SO not least I finished Anne Voskamp’s One Thousand Gifts. I started this book in January. I put it down after the first chapter because I could not suffer the pain of the experience Ann shared. If you have read it you know, if not, I will not spoil it. But, I just was not ready to ball, and had just started the Hunger Games trilogy so was not up to it. Ann got shelved. Then I picked it up and immersed myself in her picturesque poetic prose. I allowed myself to enter into her world and emerged feeling as though she touched a universal nerve. Suddenly I understood the fuss and the community that this book has birthed. She somehow manages to sketch the raw beauty of our existence in a unique and common yet powerful manner that invites all to come and take part in the journey. 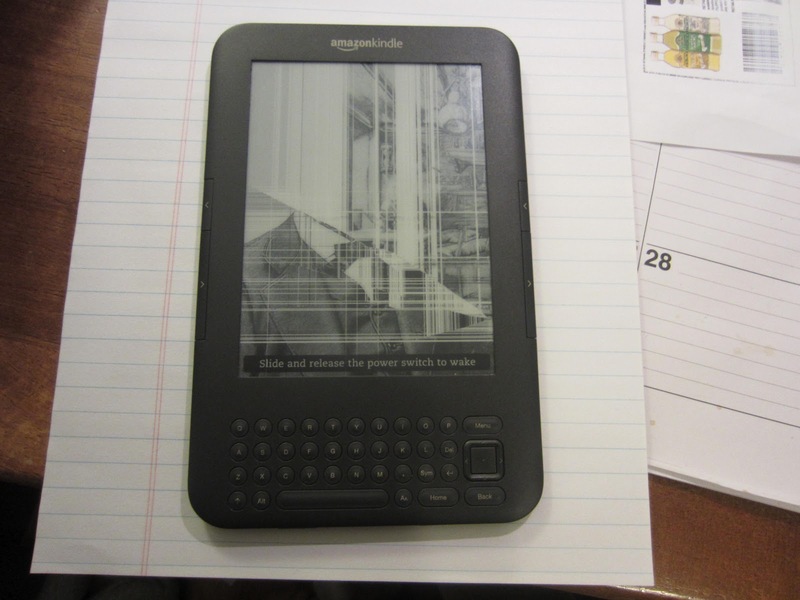 I am still lamenting the loss of my dear Kindle. Which was uninsured. Lesson learned. I hope to do better next month. Off to see what the die-hard read-a-holics put down! 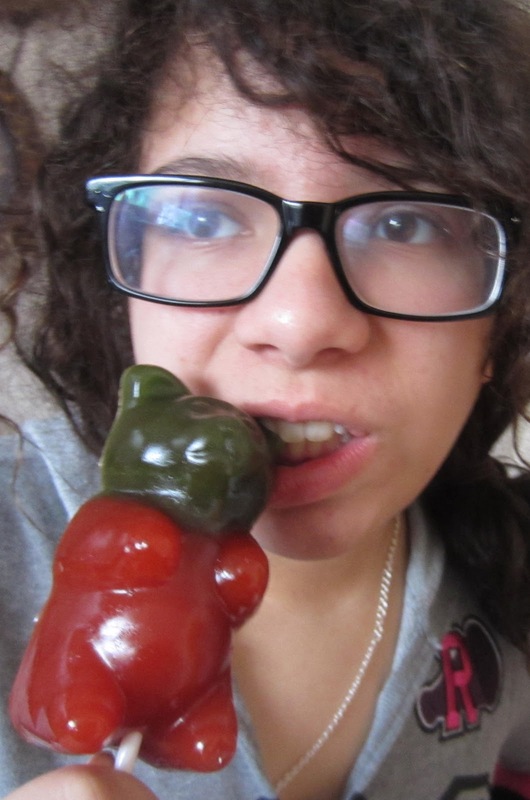 Bunnies, and Kitties and Gummy Bears, Oh My! 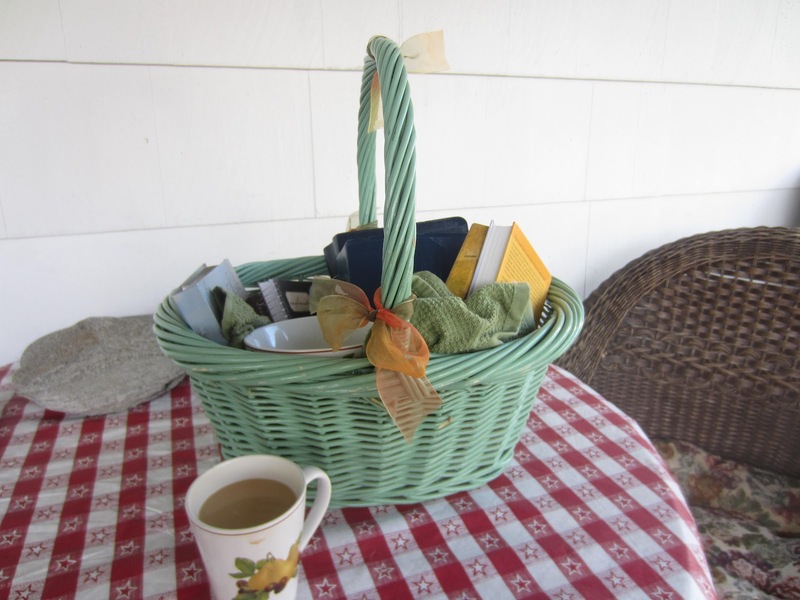 Join me for breakfast and coffee on the back deck? So I will just go ahead and roll with that! and I forgot how much I enjoy doing that! “audience of 1” for her while she polished up her Harvard presentation. I had never met Lisa in person before and was so excited, blessed and ecstatic for this opportunity! She welcomed me into her home and I got to see, listen and learn from this wonderful author/coach and felt like God gave me the most wonderful gift of the week through her! I have a whole Blog post in mind for that. 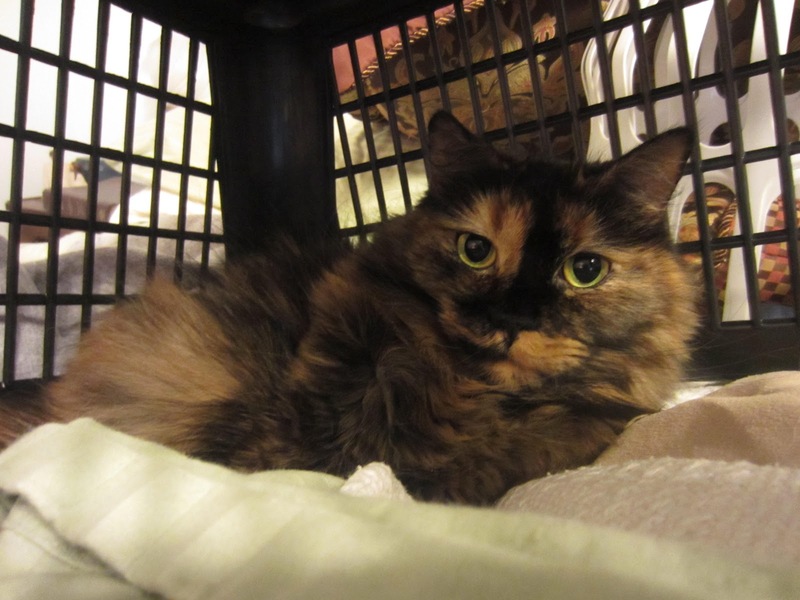 Ashley is doing well after last month’s emergency surgery. Aurora hiding under the overturned laundry basket. for the Queen of Everything. Mom brought me back this little gift from Florida. I love living near the beach. Ask me again in June when we can’t get out of our driveway due to the tourist traffic! This is my reminder…for when I start getting a certain attitude. Rocks are useful, aren’t they? Do you think it is the title? 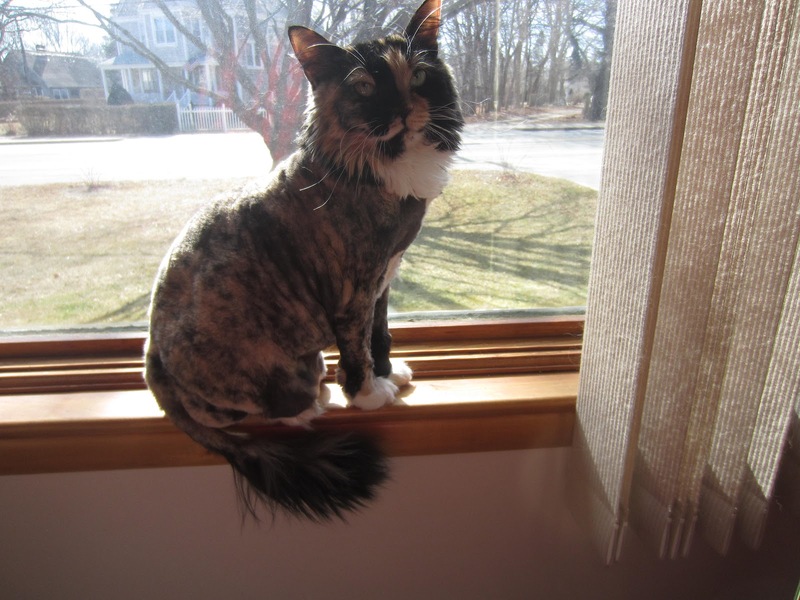 This is my favorite post that I wrote, plus Yoda is just so adorable. I just had no idea when I started where I was going but enjoyed the journey. It was one of those out of the body random pondering experiences! Still counting my gifts…and all these are! I am up to 300 in my notebook, and will resume my online next week. I have decided to open up my Faith Tab to personal testimonies. I invite you to contact me . but if you do not have one you are still welcome to share!